AN immigration judge heard this week why a teenager suffering from a rare genetic disease should be allowed to stay in England. Zarine Rentia, a 15-year-old student at South Camden Community School, was diagnosed with the one-in-a-million Fanconi-Bickel Syndrome after her arrival in the UK three years ago. She faces deportation to India if her plea fails. Zarine’s mother Tasnim told the Asylum and Immigration Tribunal hearing in Taylor House, Clerkenwell, that, in India prior to diagnosis, her daughter had been “totally dependent”, needing to be carried everywhere and unable to attend school. The condition renders bones extremely brittle, causing Zarine to suffer multiple fractures. Mrs Rentia said: “In India, my child suffered a lot. But after coming here she got her missed childhood back – her education, mobility, independence. 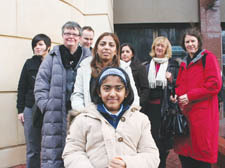 The court heard that more than 2,000 supporters have signed a petition backing Zarine, a wheelchair user expected to achieve good GCSE grades later this year. But Mathew Hoffmann, representing the Home Office, insisted the case should “not be judged on sympathy”. Tim Buley, for Zarine, said the treatment which had transformed her life would not be available in India. He added: “This is a girl who has taken the opportunity she has been given with both hands. This is a private life she couldn’t have had in India due to her exceptional circumstances. A decision is expected in three to four weeks.